Fourth Row Center: Film Writings by Jason Bailey: On DVD: "The Tillman Story"
Amir Bar-Lev’s The Tillman Story is a complicated and nuanced story of heroism, pain, and deception that unfolds like a mystery and concludes like a tragedy. Moving and intelligent, powerful and (on occasion) darkly funny, it leaves the viewer both inspired and absolutely furious. This is documentary filmmaking of the highest order. 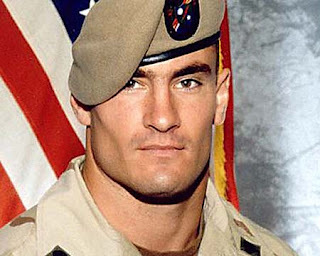 Pat Tillman was a defensive back and safety who played college football at Arizona State University before going pro, playing three years for the Arizona Cardinals. He shocked fans and his family alike when he announced, in 2002, that he was turning down a three-year, $3.6 million contract to quit sports and enlist in the U.S. Army. He never gave the reasons why; a post-9/11 interview later surfaced which indicated that he felt a responsibility to serve his country, though (the film argues) that feeling may have had as much to do with his family’s rich military history as it did with September 11th. Bar-Lev (who also directed the excellent My Kid Could Paint That) frames his documentary, for the most part, in the present tense, with the viewer discovering the facts of the incident as the Tillman family did—the first version, then the reluctant (and still incomplete) second version, and then their hunt for the truth of the matter. In response to the family’s requests, the Army attempted to “drown them” in paperwork, sending over 3,000 pages of documents, most of them heavily redacted. For the family (particularly his mother Mary and father Patrick), it was like piecing together an elaborate crossword puzzle, finding the inconsistencies, guessing at the unnamed parties, assembling the narrative that was being hidden from them. That narrative is painstakingly detailed in the film, and the events are shocking. So is the radio interview given by Lt. Col. Ralph Kauzlarich, who led the second investigation into Tillman’s death, who criticized the family for having “a hard time letting it go,” which he wrote off as a byproduct of their atheism. So is the P4 memo from General Stanley McChrystal, written the day after the Silver Star citation but warning that the military could be embarrassed by the questions circulating around the circumstances of Tillman’s death. (That memo, which made it all the way to Rumsfeld and even Bush’s people, leaked to the media immediately after the conclusion of the Army’s investigation, which insisted the cover-up stopped well below that level.) Most shocking is the congressional hearing that resulted, in which Rumsfeld and several top commanders insisted that they never got the P4 memo, or didn’t remember when they got it. No one challenges them. Rumsfeld walks out of the room smiling and shaking hands. That’s how it goes, I guess. The Tillman Story is a thoughtful, smart picture, one that works on several levels: as a biography, as a mystery, and as a probing examination of propaganda—how the stories of soldiers like Tillman and Jessica Lynch are manipulated, spun, and co-opted, expertly framed by the military and consumed without inquiry by a hungry media. But above all, it is a human story—of how a family refused to let their son, brother, and husband represent anything more than what he was (youngest brother Richard’s candid comments at his memorial service are stunning), and how they refused to let his sketchy death go unquestioned. This is powerful stuff. The Tillman Story packs a provocative punch. "The Tillman Story" was released today on DVD and Blu-ray. For full A/V and bonus feature details, read this review on DVD Talk.